Mary and Martin McAleese were named as the recipients of the award for their work in promoting peace and reconciliation in Ireland and abroad. 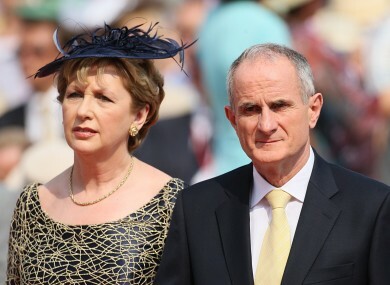 FORMER PRESIDENT OF Ireland, Mary McAleese, and her husband Senator Martin McAleese have been announced as the joint recipients of the 2011 Tipperary International Peace Award. Also nominated for the award this year were former US President Jimmy Carter, Queen Nour Al Hussein of Jordan, Dr Abdul Sattar Edhi, a Pakistani phanthropist; Zimbabwean farmer Mike Campbell (posthumously), his wife Angela Campbell, daughter Laura Freeth and her husband Ben Freeth; and former Chief of Protocol of the United States, Ambassador Nancy G Brinker. In a statement issued today, World Day of Peace, Tipperary Peace Convention said that they are “delighted to recognise the efforts of Mary and Martin McAleese in the promotion of peace and reconciliation on the island of Ireland and with our neighbouring island”. The theme of Mary McAleese’s Presidency was ‘Building Bridges’ and for many people, the highlight of her two terms as President was the visit of Queen Elizabeth to Ireland in March 2011, which undoubtedly was the culmination of President McAleese’s long and dedicated work for reconciliation. Along with her work for reconciliation she also used her time in office to address issues concerning justice, social equality, social inclusion and anti-sectarianism and her Presidency has been a healing one for which this and future generations will be eternally grateful. The organisation said that Mary McAleese was assisted every step of the way in the work of promoting peace and reconciliation by her husband, Martin, who initiated meetings with senior loyalist paramilitary leaders to pursue peace negotiations. These actions have been widely viewed as instrumental in bringing loyalist paramilitary groups to peace talks. The valuable work that he did in reaching out to people in the loyalist community enabled the development of a shared Ireland beyond violence and conflict. The Award will be presented in Tipperary at a date to be announced in 2012. Previous recipients of the Tipperary International Peace Award include former South African President Nelson Mandela, Live Aid Organiser Bob Geldof, former US President Bill Clinton, former Prime Minister of Lebanon the late Rafic Hariri, Afghan Human Rights Activist Dr Sima Samar, Ambassador Jean Kennedy Smith and her brother the late Ted Kennedy. Email “Former President and husband win Tipperary International Peace Award”. Feedback on “Former President and husband win Tipperary International Peace Award”.